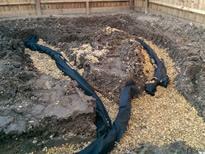 If you have a boggy garden or the water doesn’t seem to drain away then a soakaway may be the answer. Shingle and Irrigated Piping would be used as part of the drainage system. Our photo gallery features just some of the many soakaways and drainage systems that we have installed for our customers.